Quebec students finish at the head of the class when it comes to mathematics. On the Pan-Canadian Assessment Program (PCAP) tests of Grade 8 students, written in June 2016 and released in early May 2018, it happened once again.1 Students from Quebec finished first in Mathematics (541), 40 points above the Canadian mean score and a gain of 26 points over the past six years. 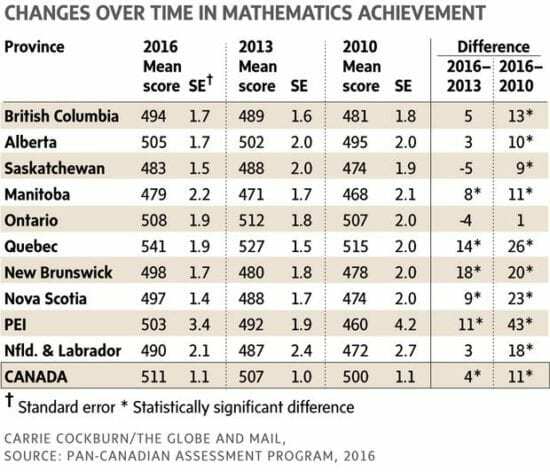 Quebec’s position as our national leader in mathematics achievement has solidified on every comparative test over the past 30 years. How and why Quebec students continue to dominate and, in effect, pull up Canada’s international math rankings deserves far more public discussion. Every time math results are announced, it generates a flurry of interest, but relatively little in-depth analysis of the contributing factors. Since the first International Assessment of Educational Progress (IAEP) back in 1988, and in the next four national and international mathematics tests up to 2000, Quebec’s students generally outperformed students from other Canadian provinces at Grades 4, 8 and 11.2 That pattern has continued right up to the present and was demonstrated impressively on the most recent Program of International Student Assessment (PISA 2015), where Quebec 15-year-olds scored 544, ranking among the top countries in the world. The reasons for Quebec dominance in K-12 mathematics performance are coming into sharper relief. The initial B.C. Ministry of Education research project exposed and explained the curricular and pedagogical factors, but subject specialists, including both university mathematics specialists and mathematics education professors, have gradually filled in the missing pieces. Mathematics education faculty with experience in Quebec and elsewhere help to complete the picture. The scope and sequence of the math curriculum is clearer, demonstrating an acceptance of the need for integration and progression of skills. “The way math is presented makes the difference,”4 says Genevieve Boulet, a Mathematics Education professor at Mount St. Vincent University who has prior experience preparing mathematics teachers at Quebec’s University of Sherbrooke. The Quebec Ministry of Education curriculum, adopted in 1980, set the pattern. In teacher education and in the classroom, much more emphasis was placed upon building sound foundations before progressing to problem solving. Quebec’s Grade 4 objectives made explicit reference to the ability to develop speed and accuracy in mental and written calculation and to multiply larger numbers as well as to perform reverse operations. Curriculum guidelines emphasize subject mastery, particularly in algebra, and tend, in Grade 11, to be more explicit about making connections with previously learned material. Academic achievement in mathematics has remained a system-wide priority and, despite recent initiatives to improve graduation rates, there is much less emphasis in Quebec on pushing every student through to high school graduation. From 1980 to the early 2000s, the Quebec mathematics curricula was explicitly designed to prepare students for mastery of the subject, either to “prepare for further study” or to instill a “mathematical way of thinking” – reflecting the focus on subject matter. The comparable B.C. curriculum for 1987, for example, stated that mathematics was aimed at enabling students to “function in the workplace.” Already, by the 1980s, the teaching of B.C. mathematics was seen to encompass sound reasoning, problem-solving ability, communications skills, and the use of technology.11 This curriculum fragmentation never really came to dominate the Quebec secondary mathematics program. SCHOOL SYSTEMS are, after all, products of the societies in which they reside. While Canadian provinces outside Quebec are greatly influenced by North American pedagogy and curricula, Quebec schooling is the creature of a largely French educational milieu.13 Teaching philosophy, methods and curriculum continues to be driven more by the French tradition, exemplified in mastery of subject knowledge, didactic pedagogy, and a uniquely different conception of student intellectual development. Socio-historical factors weigh far more heavily than is recognized in explaining why Quebec continues to set the pace in Mathematics achievement. 1 Council of Ministers of Education Canada, Pan-Canadian Assessment Program, PCAP 2016: Report on the Pan-Canadian Assessment of Reading, Mathematics and Science (Toronto: CMEC, May 2018), Table 2.1, 36. 2 Anna Stokke, What to Do about Canada’s Declining Math Scores, C.D. Howe Institute Commentary No. 427 (Toronto: C.D. Howe Institute, May 2015), p.
3 Helen Raptis and Laurie Baxter, “Analysis of an abandoned Reform Initiative: The case of Mathematics in British Columbia,” Canadian Journal of Educational Administration and Policy 49 (January 26, 2006). 4 Genevieve Boulet, Mount Saint Vincent University, Personal Interview, May 3, 2018. See also “Nova Scotia math curriculum ‘doesn’t make any sense’: education expert,” CBC News Nova Scotia (May 2, 2018). 5 Program of Study, Mathematics, Mathematics 536 (Quebec, 1997), 2. 6 Program of Study, Mathematics, Mathematics, Science and Technology (Quebec, 2017), 4-16 and 31-64. 7 Kate Hammer and Caroline Alphonso, “Tests Show Provincial Differences in Math, Reading, Science Education,” The Globe and Mail (October 7, 2014). 8 “It Adds Up: The eason students’ math scores are higher in Quebec than the rest of Canada,” The National Post (Canadian Press) (September 6, 2017). 9 See Daniel Ansari, “The Computing Brain,” in Mind, Brain and Education: Neuroscience implications for the classroom, ed. D. Souza (Bloomington, Indiana: Solution Tree Press, 2010) 201-227; and Daniel T. Willingham, “Is It True That Some People Just Can’t Do Math?” American Educator (Winter 2009-2010): 1-7. 10 Jim Dueck, Education’s Flashpoints: Upside down or set up to fail (Lanham, MD: Rowman & Littlefield, 2015), 100-103. 11 Charlie Smith, “Battling B.C.’s Math Education Crisis,” the Georgia Straight (October 31, 2012). 12 Robert Maheu, “Education Indicators in Quebec,” Canadian Journal of Education 20, No. 1 (1995): 56-64. 13 Chad Gaffield, “Children’s Lives and Academic Achievement in Canada and the United States,” Comparative Education Review 38, No. 1 (February, 1994): 53-58. For further background on the Quebec socio-cultural context, see Norman Henchey and Donald Burgess, Between Past and Future: Quebec education in transition (Calgary: Detselig Enterprises, 1987).